In my previous post, I wrote about my initial experiences with stargazing - primarily to demonstrate that it can be fascinating without fancy equipment. After those initial sessions, I bought a telescope which magnified my experience significantly. The primary purpose of an (astronomical) telescope, unlike popular belief, is not actually magnification. They act as light collectors (think burning a paper with a converging lens and sunlight). Because the aperture of our eye is very small (7mm at best), we don’t capture enough light to see faint stars. Telescopes (and binoculars) can have much larger objectives and hence more surface area where the photon can hit. Buying a telescope (or anything?) on an impulse is a bad idea. There are multiple articles/guides (like this one) that talk about various telescopes and their purposes. I’d recommend going through a few of those while having some direct gazing sessions, helps in setting up the preferences and expectations. I personally enjoy looking at faint stars and deep sky objects or DSOs (star clusters, galaxies, nebulae) more compared to planets/moon. To start with, the objects that Charles Messier catalogued. My telescope is a Newtonian reflector with a 114mm aperture and 900mm focal length. I have 3 kellner eyepieces of sizes (and magnifications) 25mm (36x), 10mm (90x) and 4mm (225x). It has a 6x24 (i.e. 6x magnification and 24mm aperture) finder. To keep the weight (and price) at a minimum, I got an Altazimuth mount. On the web, this scope is similar to mine. But I’d actually recommend Orion XT6 for much better observations or Orion StarBlast 4.5 for its portability. Star hopping is the technique that is conventionally used by armature astronomers. But with star charts, I also have Stellarium, with which I get precise details of much fainter stars. Once having pointed the scope to a bright star, I synchronize my path with Stellarium. Because I am comparing stars in sky to a star in telescope, it is possible for me to end up at the exact locations of a DSO even if I can’t discern it because of light pollution. I’ll write more about this in a future post. Orion Nebula is the brightest diffuse nebula in the sky and lies in the constellation Orion (which also hosts my favorite star, Betelgeuse). Although it looks nothing like the colourful and detailed photos on the internet. I see it as a fuzzy extended grey object, similar to Charles Messier’s sketch. It is remarkable, nevertheless. The four young stars in its heart are distinctly noticeable. When Orion was accessible, it was a ritual for me spend a few minutes on it before anything else. The Orion Nebula is an example of a stellar nursery where new stars are being born. Of all the DSOs, I find open star clusters the most exciting. I like to examine their finer details, matching each star with Stellarium’s rendering. The constellation Canis Major hosts a few prominent clusters. M41 was the first cluster I ever saw. It is fairly bright. I even sketched the star pattern on paper, which now stays on my table at work. NGC 2362 (Canis Major cluster), although not actually from the Messier catalogue, is also interesting. Most of its brightness comes from the star τ Canis Majoris. I noticed it when I was meandering around the lower part of the constellation. I saw a few clusters in and around the Puppis constellation. M93 is a nice and bright cluster. At the time of my observation, M93 was straight above the star Asmidiske (ξ Pup). Asmidiske, being yellow, is a sight in itself. It has two companion stars nearby. M47 and M46 are categorized to be in Puppis, but I used Canis Major, Hydra and Monoceros as reference for them. M47 is bright, but M46 isn’t as noticeable with my setup. Taurus had a significance for me as the host to Pleiades (M45). It is a cluster of very bright stars, with the brightest few visible without any optical instruments. M35 in Gemini is yet another bright cluster that I observed. Planets are like stars but brighter and without the twinkling. 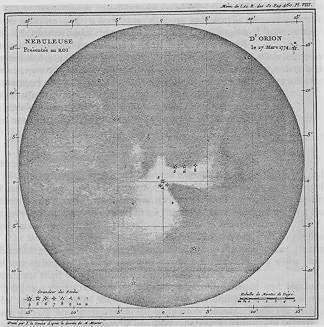 With a telescope, a few more details may be seen. The planet I have most observed is Jupiter. Initially, to my disappointment, I could only make out an extend bright white disk. Eventually, my skills improved (Jupiter moved toward opposition as well) and I could actually make out the colors and the stripes. By coincidence I even got to see the great red spot. Jupiter rotates about its axis very fast (8 hour days), and I never had actually planned a sighting. By Jupiter’s moving toward opposition, its the Earth’s movement in between the Sun and Jupiter which has significance. Of all the planets, I was most interested in Saturn. Having straightened my expectations, I was not disappointed on first sight. The ring is indeed present and looks beautiful. I haven’t been able to see the Cassini’s division yet though. More sitting of Saturn gazing are upcoming. Mars is a red/orange disk with no other features visible (yet). I saw Venus only for a few minutes. Its unlikely that I’d be able to see Mercury from where I am. Moon (although not a planet) can be seen in fine details. It is the only object which is bright enough to take photos of with my phone’s camera. But other than that, I find it uninteresting. Moreover, it obliterates my eye’s dark adjustment. Moonless nights are the best for stargazing. These tend to be faint and the city lights takes away the required contrast for their visibility. My eyes probably caught photons originating from even the ones I couldn’t identify, because I verify the location I am pointing at based on the nearby faint stars. The DSO which took up most of my time is M1 (Crab nebula). It is a supernova remnant in Taurus. I must have put in 6+ hours cumulative in attempts to observe it. Infact, I remember much of the star patterns near the nebula. But, wouldn’t claim to have seen the nebula itself. Another such object is M78, a reflection nebula in Orion. I have the nearby star patterns for it memorized as well. If at all, I saw a very dark grey and fuzzy object. M43 is nebula right beside Orion nebula. I couldn’t discern it at all though, because of the imposing adjacent nebula. M53, a globular cluster in Coma Berenices, is visible as a dim round grey object. M68 is a globular cluster in Hydra. But I could not clearly distinguish it. M104 (Sombrero Galaxy) lies near Virgo. I recently started observing it. I did notice the presence of something, but may just be an illusion. The view should improve in the future sightings. I find figuring out the limiting magnitude for my telescope interesting. Theoretically, I should be able to see stars up to an apparent magnitude of 12.8, but I can’t actually. The lower the apparent magnitude of on object, the brighter it is. My skills, light pollution, quality of optics and the atmosphere bring this down significantly. The faintest stars I have seen, with significant effort, are roughly of magnitude 11.2. Usually, I can conveniently see stars upto 10 and with a bit of effort (a second or so of concentration), 10.5. Because of how our eye are designed, moving it during observations and using averted vision improves the ability to distinguish very low contrast objects.